Dear Sunbreak friends and family, on behalf of the entire Buddy & Me team, please enjoy a safe and happy holiday season! 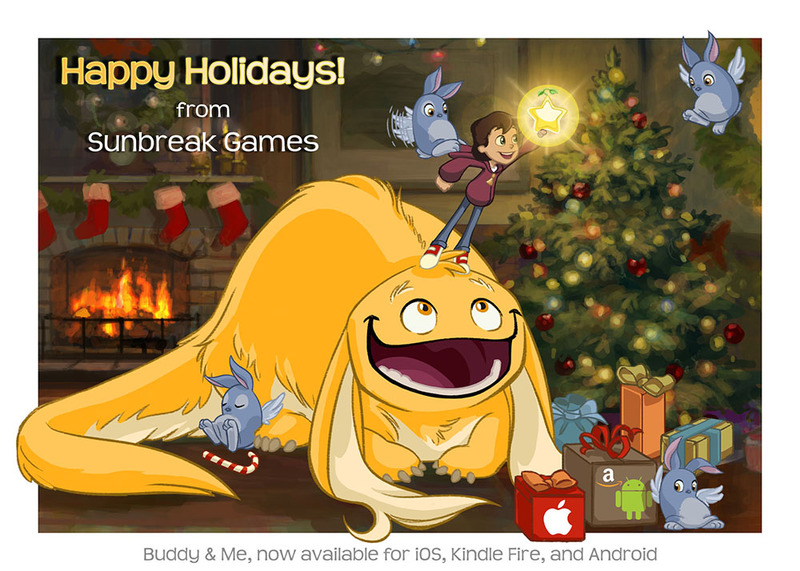 To show our appreciation, here’s a very special holiday card, and a very special holiday price of $0.99 on iOS, Kindle Fire, and Android through January 5th, 2014. Let Buddy & Me be the fun family game hiding under the tree this year! Buddy & Me Available Now for iOS, Android, and Kindle Fire! Buddy & Me has released worldwide on select iPad, iPhone, iPod Touch, Android, and Kindle Fire devices! Download it now to dream with Buddy! Visit our Projects Page to learn more, and watch our Announcement Trailer here on YouTube! Official Buddy & Me Announcement Trailer! Check out Buddy & Me’s very first trailer, for a glimpse at final gameplay! Buddy & Me is coming soon! Buddy & Me successfully Kickstarted! With the incredible support of friends and fans all around the world, Buddy & Me successfully hit its target fundraising goal on Kickstarter. Thank you Sunbreakers! 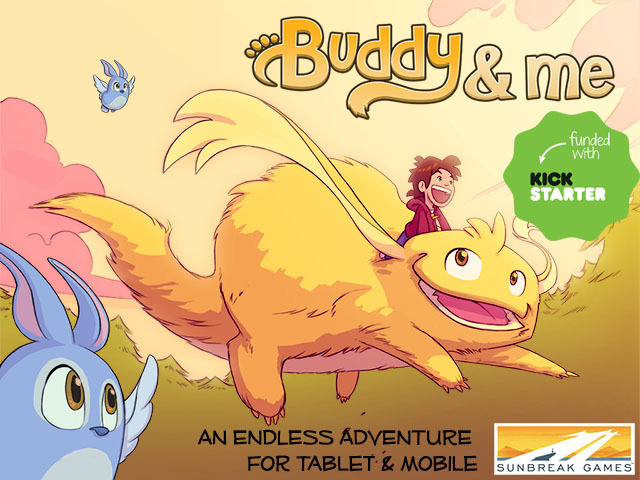 Sunbreak Announces “Buddy & Me” On Kickstarter! Sunbreak Games proudly announces its first project, Buddy & Me, the story of a young boy running through the forest of his dreams, alongside his magical best friend. 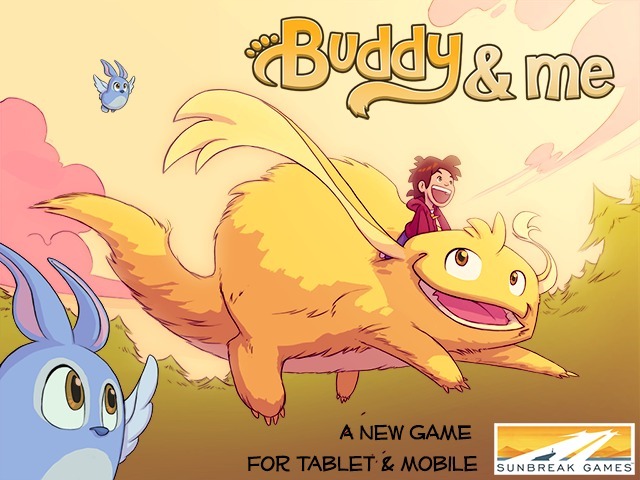 A one-of-a-kind endless runner with a friendly twist, beautifully painted 2D environments, and cel-shaded characters, Buddy & Me is estimated to release in Summer 2013 for mobile & tablet platforms. Check out our new Kickstarter campaign for more game details, spread the word, and help Sunbreak finish the dream! You found us! Sunbreak Games proudly announces its new website. Stay tuned for updates, product announcements, and other musings. Curious what Sunbreak’s all about? Read more in our “About” page. Looking to apply your talents to a unique indie studio? Check out our “Jobs” page. Want to give us a shout? Follow us on Facebook, Twitter, or just Contact us here!